Samson Szeto, communications program coordinator of ASU LightWorks, has been named to the 2017 GreenBiz "30 Under 30." The list honors young corporate sustainability professionals who strive to make an impact in their workplace and the world, and Szeto is doing just that. 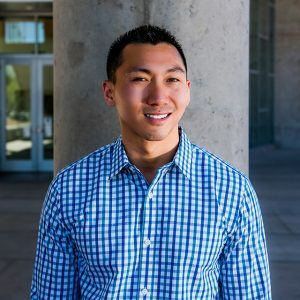 Szeto, who graduated from ASU’s School of Sustainability in 2013, was nominated by his supervisor Travis Johnson, project and business development manager at LightWorks. He was recognized for his work on several renewable energy projects – including NEPTUNE – and his involvement with carbon capture technology. The NEPTUNE project, a joint venture with the U.S. Navy and six other universities, trains veterans for careers in the energy sector. Szeto’s work with carbon capture technology involves creating strategic partnerships that unite corporations with ASU researchers working to halt climate change. "Samson is passionate about driving innovation and sustainability into businesses and society," says Johnson. "I’m proud of him for being honored with the 30 Under 30 award, and I am sure he will continue changing the world."